Libby, that's adorable! Love the funky paper. how adorable. love the colors---so fun! This is awesome...your coloring came out just excellent! This is adorable! LOVE the bright colors! So nice and colourful. You did a nice job on the colouring. Party animals! They look like they're not quite sure what to do with themselves but they're in the spirit of the adventure. This is cute, Libby! They snuggled right into this sketch just perfectly! 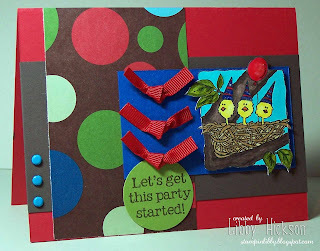 Just love this -- you make the most colorful card! !